I have a 178x13 double matrix. 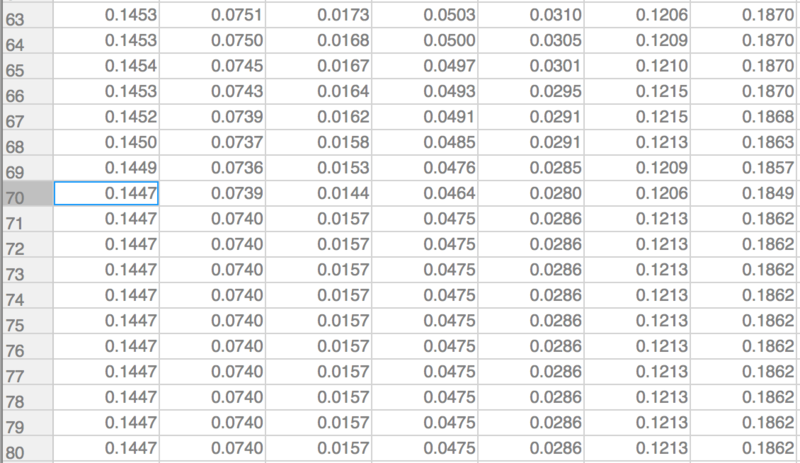 In each column there is a point where each data value starts to stay same. I want to find them (row number). For example for the first column it is 70. I tried "find(diff(values(:,1)) == 0, 1, 'first')" but it is not working. How can I do this? Thanks for the help. You can have differences equal to zero that are not in the last stretch of zeros. Therefore you need to use findgroups() or regionprops() to find the first element of the last group of zeros. If you need a demo, attach your data in an mat file with the paper clip icon. I saved the matrix as a txt file.